This month I am looking at the 7 swords. The 7 is Netzach on the Kabbalah this is the sphere of Venus it is the place of victory over things. It is also a place of illusion – things not being quite how they seem. 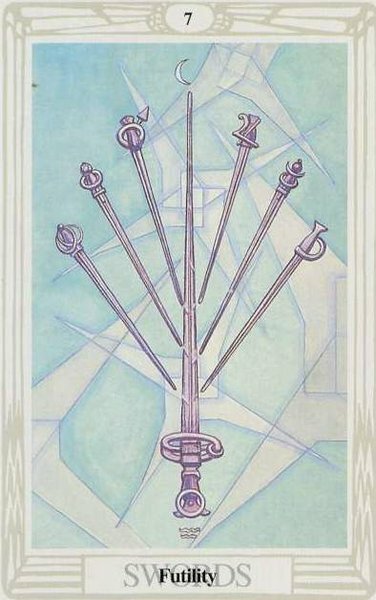 This card is the 7 swords so it is an imbalance in one’s thoughts and the mental realm. However there is a sense of victory and these low expectations, and illusory thoughts can be overcome if one puts one’s mind to it. The larger central sword representing the will to overcome the smaller, yet many, objections to the idea, plan or situation. This card is very much about overcoming a negative attitude and forging onwards with your plans despite there being a bit of a mental struggle. Two rings – Snuffin sees these as representing the moon and the influence of the unconscious hidden feelings and motives within us holding us back, where as Hajo Banzhaf sees this as representing the illusion from Neptune, intuitively I sometimes see this as representing two rings of thought – two visions on what is needed in a situation and the fluctuation from one to another. Mercury – Everything is slipping through your fingers – it’s too late – you have already got too far behind – you will never catch up. The final sword is also in dispute about what it is ‘supposed’ to mean with Snuffin suggesting it represents a link to the higher realms of the Kabbalah, and as such is even understanding and intuition is affected by the struggle, it is the time when you don’t know whether your intuition is speaking or whether it has been affected by fears and want to achieve in equal portion leaving you unable to truly connect with the pure source. Hajo Banzhaf sees this symbol as representing Saturn and so it represents a stubbornness and inability to set oneself free from the negative thoughts and influences. This card is about this inner struggle we have at times, but the strongest force – our true selves – can indeed win over as we realise our objections and those we have heard on the outside are just reflections of our fears and negative expectations. We can rise above it and move forward with ease as we let go of our fears. In many ways we can see this as being representative of our shadow selves wanting to be heard, whilst we ignore them and battle on it is hard work, however if we turn to listen to each objection in turn and hear it understand its fear and foundation and then say I hear you and I am going to continue with the plan so you transmute the difficulty and become the wise leader of your inner selves.